All the great old baseball parks in America are gone — except Fenway Park. 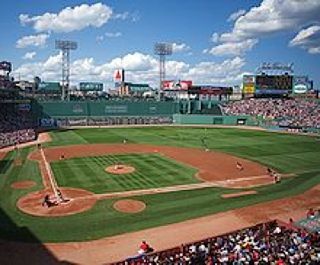 Today marks 100 years since the Boston Red Sox played their first game at Fenway, tangling with the “Green Monster” in left field and testing their skills against historic rival the New York Yankees. This evening the Red Sox and Yankees pair up again for the centennial celebration of the quirky building squeezed into a downtown neighborhood, which turned out to be the most beloved aspect of being a Boston fan. In a ballpark this small, with seats just inches from the foul lines, fans here literally become part of the game. You can lean over the dugout seats and bump elbows with a coach. “Every game is electric. And you can just feel that,” said one Fenway fan. Yesterday, the park held its first open house letting 54,000 fans enter for free, roam the sacred dugout, and touch the huge green wall. Last month, the building was added to the National Register of Historic Places.